Over the past decade, there has been a dramatic shift in the way healthcare organizations confront medical errors after an adverse outcome. Unfortunately the tradition approach has led to limited communication between the healthcare providers and patient’s family members. However, given the overwhelming success that many organizations have documented with disclosure, apology, and offer programs, it has become evident that Communication & Resolution is not only the morally right thing to do; it is also the right thing to do financially. The Sullivan Group partnered with Sorry Works! in 2013 to provide healthcare organizations with a scalable solution to ensure their clinicians are trained to empathize without admitting fault. The RSQ® Solutions - Communication & Resolution Program empowers healthcare organizations by providing real-time tools and the advanced training resources needed to successfully implement a Communication & Resolution program. 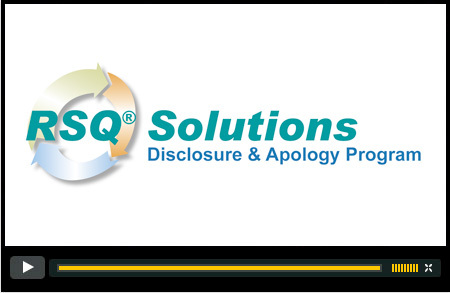 Unlike other approaches that rely heavily upon a top-down strategy, the RSQ® Solutions - Communication & Resolution Program offers a scalable alternative to ensure all healthcare personnel have been appropriately trained in empathy and disclosure through a comprehensive approach. Each component of the Program provides significant value in establishing and sustaining a positive change in culture throughout the organization that leads to reduced liability costs.